Although lightning storms are a fact of life for most of us, when it comes to what we should actually do and how we should protect ourselves, it seems as if there are as many unfounded myths as there are real facts about appropriate safety precautions. Every year, about 400 people are struck by lightning. Forty are killed and most of them are men using heavy machinery or farm equipment. Boaters and golfers are also among the more common victims. Then, of course, there's the damage that these powerful storms cause to our homes and electrical equipment, to say nothing of the troubles caused by golf-ball-sized hailstones and flash floods that often accompany them. If you're heading out to anywhere that you might be exposed (including camping and boating) check the weather forecast before leaving. If you opt to go when you know there's a possibility of a storm, take a radio (even if there's no station, you'll hear static) and have a safety plan based on a nearby location. 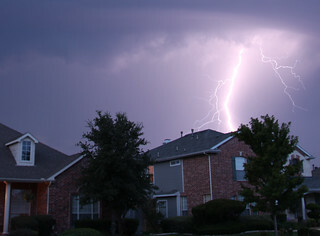 Because lightning often strikes before a storm arrives, seek safe shelter (see below) as soon as you hear thunder, and stay there for at least half an hour after the last thunderclap. There's nowhere safe outdoors but avoid open fields, the tops of hills and tall, isolated trees or structures. The old idea of lying on the ground is a myth it's not safe. Crouching is better. In open water, get to land as soon as possible. The safest place is inside a large building that has plumbing or wiring. Examples are shopping malls, offices and, of course, homes. Enclosed vehicles, including school buses, are also a good safety bet. But places like beach shacks, metal sheds, carports and porches are generally not safe. Inside a building, unplug and then stay clear of appliances and plumbing. Ideally, go to an interior room. Don't use appliances, especially computers and corded phones except in emergency. And don't use a shower or tub. In a vehicle, close windows and keep your hands clear of radios and the ignition. Outside a building, stay clear of metal equipment.